We probably all sang that song in elementary school, though I’m sure I massacred it worse than most. The song isn’t the only memory of that name though! Back in the…umm..80s? 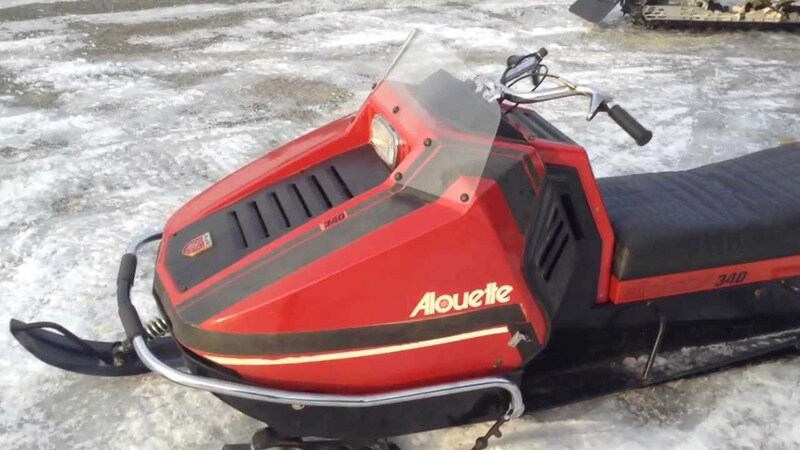 and maybe before, as he had it a long time, Ross Smith had an old Alouette Snow mobile, very like the one pictured. Later on he sold it to Dad, I hope for not very much, because to be honest it wasn’t worth very much! I did get to have a few adventures on it, one I’ve documented before. Though more of a great memory of Uncle Hay than an adventure really. We went out on the sound on it fishing one year when it froze over, you can read about it by clicking this sentence. I’m sure the machine in its time was a good one, but it was, if memory serves, a 1974 model, and weighed about 4 billion pounds. For those who know such things, it had a 2 cylinder Kohler engine, it was probably very like the one mentioned in this article. The 440cc that is. It also had a center drive track that we had to replace, was pretty rotted out when we got it. I think we had to order it in, and if I remember correctly, from Parts Unlimited (Thanks Dennis, I couldn’t remember the name) that was just in past Murphy’s as you went in around Shoal Harbour. I remember Elvis Cooper and I stopped there too on our trip down to his cabin one winter. It had a speedometer on it, and god knows how accurate it was, but I once took it on the ice up to Snook’s Harbour, and though it wasn’t running on both cylinders correctly, the thing was clocking 80mph. I’m sure that was inaccurate, but it could definitely bang along! But like I said it was heavy, you needed to be a lot stronger than me to deal with it to be honest. Also was a pull start, and that could strain the guts out of you just getting it going. I once took a ride in to Island Pond path behind Apsey Brook (which if you know the area, wasn’t a very good path to begin with), and when on the way out, slid off the track a little right by a goowitty scrape which sloped down to the brook. Of course I couldn’t budge it, and of course, like always, it flooded, I ended up walking all the way out and having to ask Sam Kelly to come in and help me get it out. After that, I honestly don’t remember much about it, which is probably for the best. Afterthought: Lorne Patey also had an old Ski-Doo once. A 1972 Evinrude I think it was. Another name you don’t associate with snow mobiles anymore! The place where you bought the track was probably “Parts Unlimited” in Shoal Hr. I bought ski doo parts there in late 70’s and 80’s. Thanks Dennis, updating it to change it!